Bank enrollment for Refund Advantage and TPG/Santa Barbara banks will be done within Taxware’s 2017 Wintax Program. Check for Updates: You must have the latest version of Wintax. Wintax NextGen: This year the bank enrollment application must be completed in our Wintax NextGen software, if you do not have the Wintax NextGen program installed, it is available to download from our website. If you need help installing the program, call us at 800-877-1065 and one of our technicians will help you through the process. 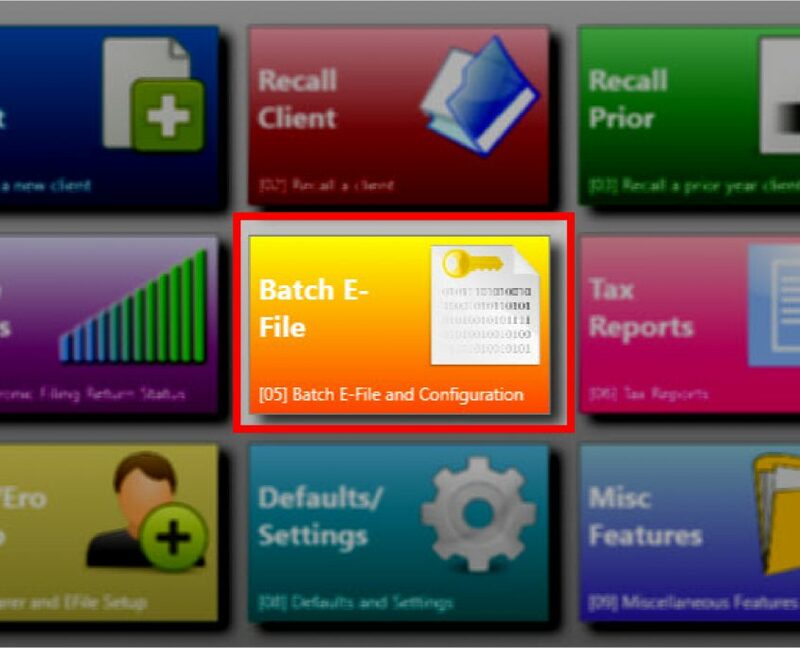 Choose “Batch E-File”  from the main menu. 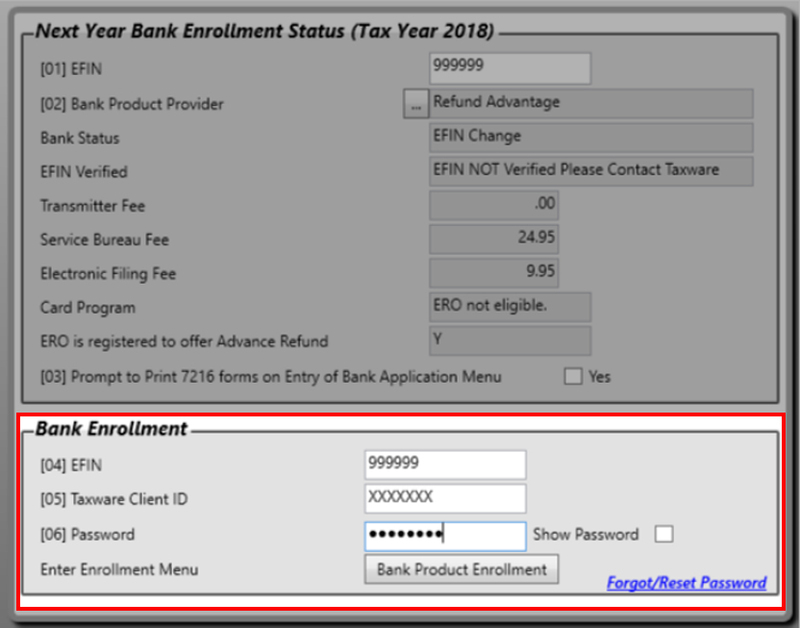 In the Bank Enrollment section you will enter the EFIN, Taxware Client ID, and the password you used last year. If this is your first year enrolling; enter in your EFIN, Taxware Client ID, and a password that you will remember. A new enrollment record will be created if your EFIN is not in our system. If you are renewing your enrollment, the program will carry your prior year data forward. If you are with Refund Advantage there is quite a bit of additional information. Please take the time to review all items. 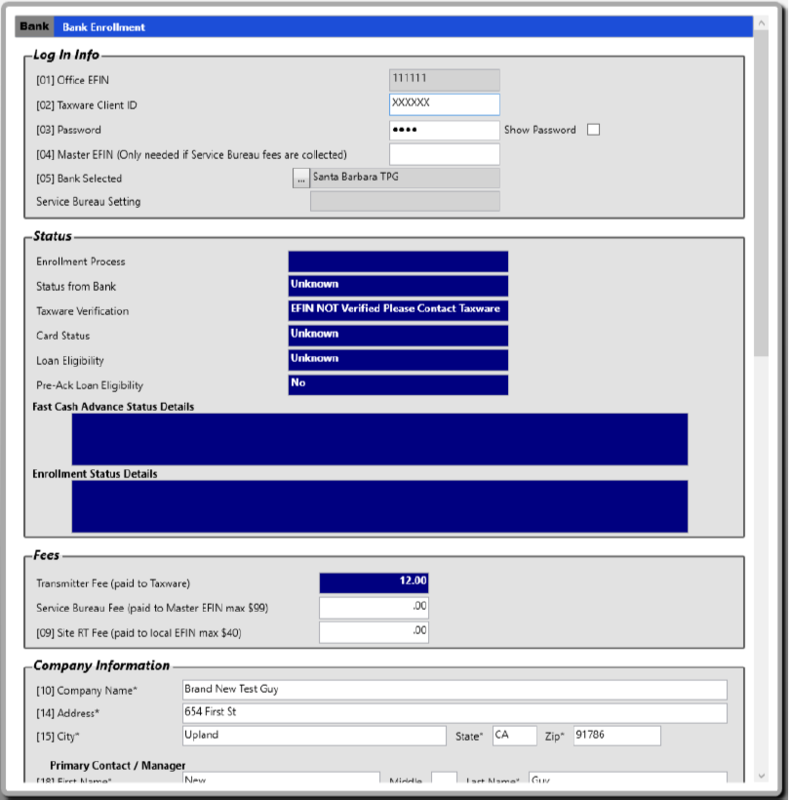 If you will be enrolling with multiple EFINs, you will do this process for each EFIN. If we do not have your EFIN in our records, your EFIN will need to be verified before being able to process bank products. If you see “EFIN not verified”, please contact Taxware to get your EFIN verified. Click on “Bank Product Enrollment” button. The Bank Enrollment Menu will now display. Please complete all information requested. When complete click on OK at the bottom of the screen. If there are any required items missing or detected problems, these items will show in red. All red items must be corrected before the application will be submitted to the bank. When you click OK and there are no errors detected, your bank enrollment will be submitted to the bank. You may return to this application to view your enrollment process and status responses from the bank.